It is always a bit "touchy" to incorporate anything Middle Eastern to alcoholic drinks. For a promotion, Robin the Restaurant Manager of our Arabic restaurant asked me to create a drink. We agreed, that a Sangria would be refreshing and would have sufficient mass appeal. 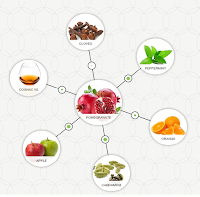 These days, I am picking a specific drink and then go to foodpairing.com to pick other aromas, to compliment the main ingredients. Sangria should not be made with expensive wine. In fact, a full-bodied tannin rich wine, would rather be the wrong choice. Originally it is made in Spain with Tempranillo (and everything but the kitchen sink) based inexpensive red Spanish wines... but any medium bodied red wine would be fine. I have used an "every weekday-evening" wine from Southern France - and it was perfect. Maybe it is just me; but wine, which is infused (over several hours / over night) with apples taste kinda rotten. We went around this, by cooking red apple balls (I was using a small melonballer) sous vide in a simple syrup - and added cloves, cardamom and a tiny bit cinnamon stick to it. The then infused syrup, was also fantastic in the finished product. I also used orange - but I chose only using 1/4 of thick wheels of oranges as garnish. Further we broke of a small piece of pomegranate, which looked almost like a gem and finished the drink with a mint sprig. Besides of the wine and the syrup of the apples we decided to use (fresh) pomegranate juice. It almost blends indistinguishable with the wine, which works quite well in my playbook. Second, we had to bring up the abv. Hence a bit of Brandy (Torres Hors d'Age 20) worked wonders. Peel apples, Prepare apple orbs with a melonballer and keep them in lemon water, so they don't turn brown. Add into a vacuum bag, add 500g of cold water and 500g of sugar - and some crushed cardamom seeds, a very small piece of cinnamon and 5 or so cloves and vacuum. Add into your sous vide rig (I used here a convection oven on the steamer setting) and "cook" it for 45 minutes on 80 degree centigrade. After the time has elapsed, chill the vacuum bag in ice water. Use your favorite carbonation device (I used a Soda Plus). Add fresh pomegranate juice (300ml), apple-cardamom-clove syrup (180ml), red wine (500ml) and some ice into it. Carbonate with one CO2 cartridge (you want to have a light carbonation). Add ice into a wine glass. Pour in the carbonated Sangria. Add some orange wheel quarters, 2 apple orbs and a "nugget" or pomegranate. Garnish with a long cocktail pick with another piece of orange and apple orb and add a mint sprig.